As a Reiki Practitioner, I work with the energy fields in our body called Chakras. Each chakra has an area in our body that we increase in energy or deplete, depending on how we think, speak, and act in life. The Throat Chakra is linked to our personal integrity and sense of honour. When we say what we mean and stand by our word, we influence the way people and the world perceive us. The throat is our outlet for communication, speaking the truth, assertiveness, connecting to our creative energy and our vitality. When this chakra is blocked or low in energy we can feel tired, lethargic, have problems with our thyroid, throat or voice. Nearly all dysfunctional emotional issues are suppressed in the throat. Growing up I often had trouble with my throat and tonsils and at times was scared to say what I wanted or felt. This extended into Adulthood, where I avoided conflict and found it difficult to express my truth with those around me. Suppressing these vital feelings was never good for my health or connecting me to my true-self. Overtime letting go of old beliefs and healing, I was able to speak my truth and began to trust I could say what I needed in life. We are all perfectly unique and while you may not have any problems in this area, we all have an area that needs work and healing always leads us into our highest potential. Where in my life do I suppress saying what I need? Speaking with honesty takes courage, where can I step out and stand strong in my truth? Where can I communicate more clearly with others so they understand who I am? How can I express my truth creatively? Where do I deny or lie about who I am? Questioning our style of communication and developing a wholesome relationship with the truth is the beginning of healing our throat chakra and opens this area to receive vital energy and healing. Allowing our feelings to be shared deeply when we are hurt or angry. Create activities that can express who we are, through writing, art, drawing, dancing and singing and giving freely. Saying “no” when we need to and saying “yes” when we want to. Speaking the truth and affirming our true nature. Living our truth connects us to our higher-self which guides us to live fully and communicate more deeply. As a child, I had many throat infections, tonsillitis. It happened at least once per year until I was 12. My mom would take me to the doctor, I would get antibiotics and life would go on. The doctor said they were not as quick to remove tonsils as they used to be but if I got tonsillitis again the following year, they would remove them. I never got it again – I often wondered if I thought throat infections away as I was so afraid of doctors. Diana thankyou so much for sharing this part of your life. Having practised this type of healing for 8 years now, I am a big believer in how our emotions and our belief system play a big role in our health and how we see our life. Re: No and Yes. Jesus instructed His followers to let their “yes” mean “yes” and their “no” mean “no.” Anything else is from the evil one. Black and white are clear; but in grey- that is where evil can be found. Re: truth. 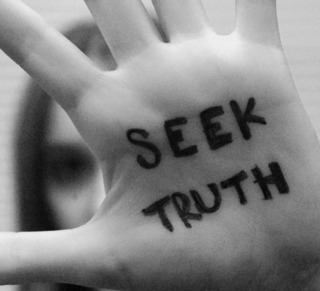 We all seek the truth. For how can we live a valid life without it. Yet too often when we’ve found it we put a spin on it; especially when it requires us to change our ways. I have gotten much better about saying what I need to say. But if I for some reason cannot speak my truth, I write it and that helps a lot. I also read what I have written aloud. Not the best, perhaps, but at times it is all I can muster. Every little bit helps Emilie. Writing is a wonderful way of expressing our truth. Thankyou for sharing. Wise words. Hard advice to follow at times, but oh so wise. This post hits very close to home. Thank you for sharing this wisdom. I appreciate your comment Jim. I am glad it resonated with you. I believe you never lie Rommel! You are right, it is good to be honest just as long as there is also compassion and understanding towards the person you are speaking to. Not everyone can handle the truth!! 🙂 Thanks for your comment. It is a lifetime of healing Heather, and Im so glad you have found balance in your life. It’s amazing how much emotion and energy we have stored in the throat over the years, I am glad we have the ability to know and understand so much more than we used to. Thankyou so much for your comment. Bowing in gratitude to you. Thank you for the kind comment. Blessings to you. Karen I am the quiet one in the meetings. But my father often said we need some gentle souls, we can’t all be loud all of the time. I had tonsillitis all the time as a teen. I was so quiet and often wished I could speak my mind like my friends did. So it makes perfect sense now. I am just learning how to say no, and find it very hard, but necessary. Age has given me the gift of wisdom thankfully when it comes to saying no. We should all start a “Tonsilitis Group”! It seems that a lot more women than men, struggle in this area still, when we find our voice and learn to say “no” it gives us the freedom to use our energy on much more important tasks. Thanks Kath for sharing your experience.